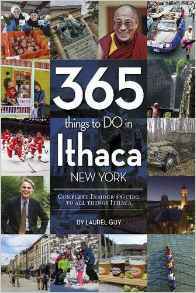 Laurel Guy is the author of the new book 365 Things to Do in Ithaca, New York. 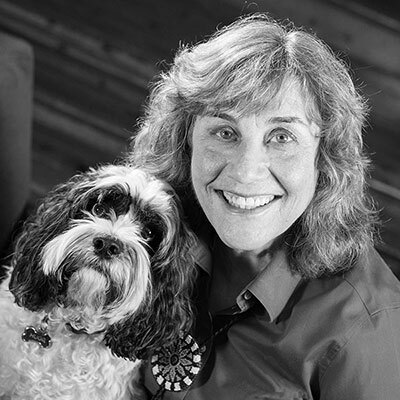 A Realtor and a founder of the Ithaca Artists Market and Circus Eccentrithica, she has lived in Ithaca for 35 years. A: There were a couple of things. I’ve lived here a long time and I really love it. It’s so different from where I came from. One day I had an idea to write down one thing each day that I love about Ithaca. I allowed it to be very intuitive. There are 365 days, but there’s more in there—the people, the history, interesting folklore, but plenty of things to do. It took me through the year. There were two elements—wishing I could explain what it is to live in Ithaca, and doing the project—that became the essence of it. I realized how inefficient it is [to learn about a place]—it’s a little easier now, online, TripAdvisor, restaurant reviews, but that’s quite superficial. We learn a place from each other. With almost every case I remember who told me each thing—little micro-stories. That’s how we create a community. I put it in one curated list—“did you know?” People can talk about it, bring it to work. You can read it chronologically or read it at random. Either way you dive into something interesting. Q: You mentioned that you came from somewhere very different—where was that? A: I have a Southern background, the Southeastern U.S. It’s a very different mindset, very different geography. The way the place looks, the houses look, people act—there are some similarities but there are vivid differences and distinct seasons. Spring explodes [here], and it’s like fireworks. It’s such a renewal. Q: So how did you pick the thing to focus on for each day, and how much research did you need to do? A: It’s very intuitive. I had a certain way of doing it. One day I put down a restaurant, the next day maybe I’d feature a historic story or a place to take a hike. I had certain categories I tried to vary. It’s very beautiful here—there are natural wonders and spectacular views. There’s history—so much has happened here. In terms of research, when I determined it would be a book, yes, I made sure [it was researched]. When I posted it on social media it was casual, but when it was something lasting, it was fact-checked, researched. Q: You also have photos accompanying the text. How did you choose them? A: I took a lot of them, over one-third. Others are from local photographers, who are all credited in the back of the book. That was the fun of it—I also am a visual artist, I have a very good eye, and I had fun taking those. I was able to utilize the archives at the History Center, our museum here. Cornell photography was very helpful—I had to get permission. Q: Who do you think is the perfect reader for this book? A: Based on feedback, a newcomer. We have lots of people coming here. We have schools, [including] Ithaca College and Cornell University. Many people like to settle in Ithaca—it has a vibrant life to it. They are coming here because they’re getting a job or a degree in higher education. Also, it could be for someone who’s been in Ithaca and moved on. People remain extremely nostalgic about Ithaca. I have heard from old friends who haven’t lived here for 20 years so they are crying from reading it. It’s like having Ithaca in the palm of your hands. It’s a very unusual concept, it’s not a traditional guidebook. A: Another project, also Ithaca-centric, about unusual homes—unconventional…as well as historic. Q: Anything else we should know about 365 Things to Do in Ithaca? A: It feels a little like a kaleidoscopic view of Ithaca. You could open it at random or start at day one, and every time you open the book it will have a different perspective on this time and place. It’s even fresh for me, even things that are familiar to me, you forget. There’s seasonal amnesia—now it’s winter, and for the life of me, I can’t remember, it’s hard to imagine [other seasons]. I can’t really see summer, and when it’s summer I can’t see winter. That’s what kept me here all this time. There’s a surprise for me every time, this change of season. In a way that’s how all these little stories are. Whatever it is, when I open it up, it’s incredible to remember what makes life so rich. It’s dedicated to Ithaca with love—that’s the intent. Life is made up of these little things, and you pick something each day. Certain things were fun—Day 161 is a climb to the top of the clock tower. It has 161 steps to the top. A lot of people have never done it. You get to the top, and there’s a concert going on, a panoramic view—it’s amazing and you get in a workout too! I hope people will enjoy it.